When I first started getting the box, and I first started reading more and more about the importance of eating locally and seasonally, all the literature assured me that my tastes and my body would grow to love it. That the zucchini would run out just when I was tired of it, and come back when I was missing it again. I would be thrilled to see the return of the oranges just as the stone fruits went to sleep for the winter, and that the coming of asparagus would be one of the highlights of my spring. I have to admit that I wasn't so sure I believed it all. I thought that a year in which avocados were available every day and that beets didn't have a season sounded more like paradise. I'd rather have basil grow all winter long and skip the turnips, thankyouverymuch. But once again, as it turns out, the experts know a tad more than I do. This winter I realized that a stew just hits the spot on a rainy day (and that turnips actually are a perfect part of a good stew!). And while I was eating hot bowls of creamy cauliflower soup or slow-roasted squash, I never longed for an avocado. (I'm still not sure I will ever last as long as zucchini season does, though). But when the days got warmer and longer, it was so nice to see basil come back, along with it's perfect partner, tomatoes. It is paradise to spend a warm afternoon on the patio eating a no-cook appetizer of basil, cheese and tomatoes stacked together, and some avocado on the burgers we are grilling. So, because I have spent the spring so happy to see my old friends come around again after months without them, I haven't done much new with them. As I unpack the box every week, I find myself saying things like "Awesome! Asparagus! I am going to make those appetizers I tried last year!" ...or... "Oooh! Lemons! Time for some more lemon curd! And lemon cookies! And lemon bars! And lemon COCKTAILS!" When the snow peas came last week, they didn't stand a chance. I was so excited to see them that I stood and ate them plain and raw as I unpacked the rest of the box. But then I ran across a recipe for an asparagus salad that sounded just right. It happened to include no less than six ingredients that were all in my box this week! (See why cooking seasonally is so much fun!?) 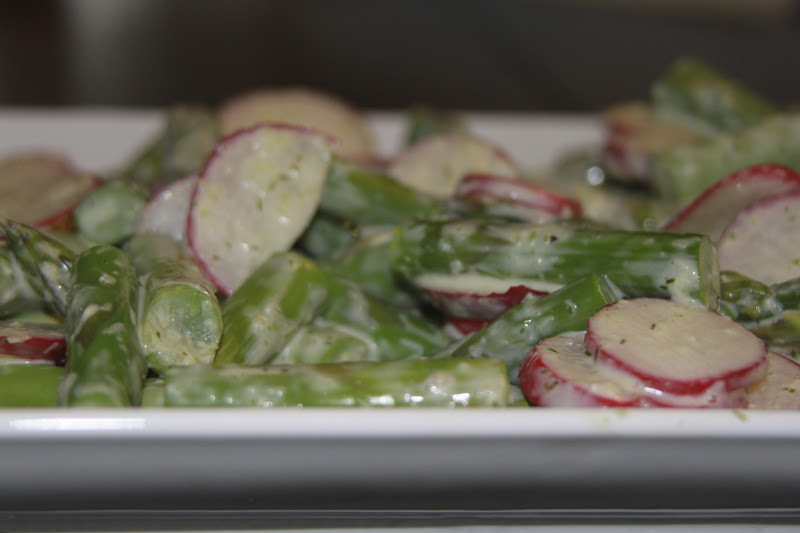 The salad just basically steamed asparagus and sliced radishes, but it is tossed in the most delicious dressing. I made enough dressing that I had enough for the asparagus salad, and plenty more to store in the fridge. 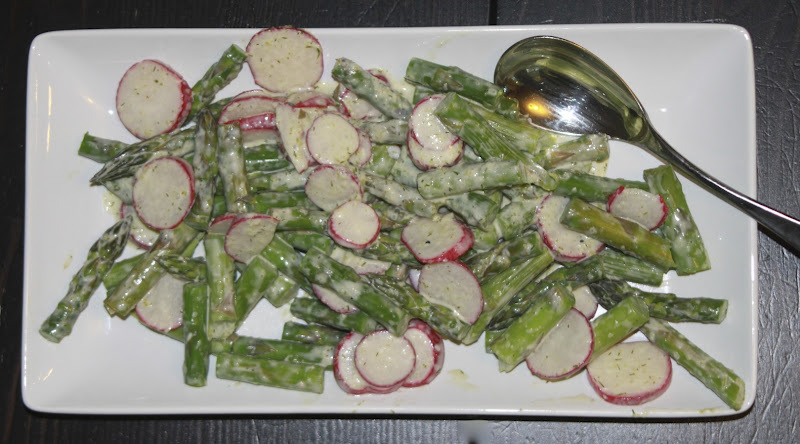 I have used the leftovers for a regular garden salad as well as a dip for raw veggies. Maybe this week's snow peas will at least get dipped before I make quick history of them! This one came from Food 52, a site I am looking forward to exploring more! Steam the asparagus on the stovetop or in the microwave. Slice the radishes thinly. Place all of the remaining ingredients in a blender and whir until they are well combined. Toss the vegetables with the dressing, and keep refrigerated until ready to eat!